Travelling to the Philippines as part of a group has many advantages. You can meet like-minded individuals and make new friends. On top of that, group tours also allows for discounted bundle deals – so you get to enjoy everything the Philippines can offer at much more reasonable price. It makes no difference if you come with your own group of family or friends, or join one of our organized group tours – we will do all we can to make sure you get the most out of your vacation. Read below to discover our most popular group packages, as well as how to find the best deals. These packages have predetermined dates and are open to anyone who wishes to join. Group tours will go through as soon as enough people sign up. Alternatively, you can set your departure dates by contacting us, and we’ll find you some suitable companions. For private tours, just visit our best tours and attractions page and pick the ones you like the most. We believe that joining a group tour package is a great way to experience the Philippines. Whether you are traveling solo or with people, and you feel more comfortable in a group of like-minded individuals, traveling in a group has its merits. Traveling as a group helps you reduce costs and get better deals, as well as meet interesting people that can become your friends for life. 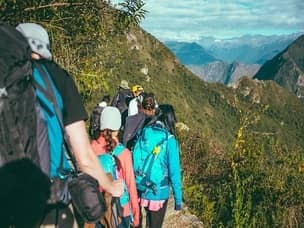 If you are in stages of planning your trip your own group of friends or family, you can easily book any of our packages and we’ll modify it to meet your needs as a group. The Philippines has many destinations that are perfect for small groups of any type- friends and families of any age group. If you’re still unsure what’s the best destination for you private group, contact us for free advice. Our organized package tours are designed for small groups – usually no more than 12 people. We feel that is the best way to make sure you get the most out of your holiday. Small groups allow for extra attention from our staff to your specific needs and desires. Packages include airport pickup, transportation to various destinations of your choice, group accommodation and an assortment of guided tours – full of fun and adventure, tailor made to meet your expectations. What’s the right group package for your holiday? Our group packages will fit most, and we try to make them wide enough that they will give the most complete Filipino experience that one can get. However, because our packages are made to fit a variety of people, you might feel that they don’t meet your desires perfectly. They might be too short or too long, or they exclude some places or activities you’re interested in. If that’s how you feel, there are several options available. If you to travel for longer, tell us and we’ll arrange a private package for the continuation of your trip. Another option is to contact us and tell us what you had in mind regarding your vacation. We will propose an itinerary that matches your desires, and will try to find people who want to share the same experiences. The tours we offer cater to different people, and focus on a specific interest. For example, our families group tour package is meant for families with kids who want to travel with the company of other families. By doing so the kids can entertain one another while the parents can have some peace of mind. Joining a group isn’t the only option you have if you travel as a family, as you can build your own custom made family package. Our adventurous Philippines package is good for anyone as it includes many of the most iconic destinations in the country. If you wanted to have a diving vacation in the Philippines, our diving group tour package will allow you to join with other divers. 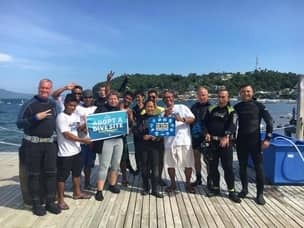 It’s highly advised for singles and small groups of divers to join a group, as it ensures you’ll get the best deals, and have private and group homogeneous diving tours. We offer day tours for every destination we review, each according to its own unique attractions and recommended activities. All these tours are escorted by a local guide, and can also be incorporated into any package you order. Sometimes it’s nice to spend just a single day with new people and make some friends. It’s also a way to save money, as many of the tours have a fixed price which is good for a set number of people. By sharing your experiences with people you also share the costs. Every place you’ll visit is good for joining a day tour, and the more touristy it is, the more chances it can be done. When you book your vacation, inform us that you’d like to join a group in all or some of the tours you’ll take. We will do as much as possible to adjust your package according to availability, as some of the day tours are impossible to book as a group tour a long time in advance. One of the largest and most populated city in the world, Manila is always teeming with action and interesting people. It’s easy to feel lost in such a big city, and that is why joining a guided tour is ideal. Booking private tours to many of these destinations doesn’t always make sense, as upon arrival you will be surrounded by fellow tourists anyway. We can help you figure out which of the tours are better taken privately and which are better as a group, according to your preferences. For those looking for ways to pass their days in the city, there are no shortage of options. The best idea is to visit one of the amazing location nearby, such as the Taal volcano in Tagaytay, Mount Pinatubo or Puerto Galera. Joining a group will make it more convenient and faster to visit those destinations, and make your time in Manila unforgettable. Day tours inside the city include viewing historic landmarks, or visiting museums to learn about local history and art. One especially recommended tour is the culinary tasting through the Chinatown district. No matter what your interests are, we can easily pair you up with an expert guide, and help you find companions with similar taste should you wish so. Is a group tour the best option for your Philippines vacation? It really depends on the type of person you are, but many people find it more comfortable to travel in groups. If you are traveling solo, or as a family with kids, you should consider this option as it can make your holiday much better. Also, if you have a very strong interest in the activities offers in our packages, like diving for instance, joining a group tour is advisable. Since it’s really a matter of personal taste, we strongly advise you to go through our destinations catalog for better insight. No matter what type of holiday you have in mind, our crew can help make it better. We created these flexible packages to ensure you will be able to get the most out of your vacation. We will be with you every step of the way and make sure you are getting all the guidance and assistance you require, so you can enjoy your dream vacation to its fullest. Hi…am planning to visit cebu soon and will spend around 4 days there..i will be alone but would like to join other group of people for the tours and sight seeing…i have already booked my hotel..so i am looking for only tours/sight seeing..it could be in coach bus or minivan…can you suggest me some tours and price? Hey Ravin and sorry for the delay in response, We are actually in Cebu right now trying to negotiate better deals for our clients and come up with with more exciting tours to try. Luckily, Cebu is one of the best places to join group tours and it’s a great way to sample all the attractions the area has to offer. If your hotel is in Mactan island, joining these tours through your hotel should be possible. All 5 star resorts and some of the 4 stars as well offer this service. It might be better to do it that way so you’ll get a chance to meet other hotel guests and possibly make new friends. Alternatively, we can connect you with independent tour operators in Cebu and they’ll be happy to find a suitable group for you to join. This option is cheaper, but you’ll sometimes be forced to wait a bit as their van picks up people from multiple hotels. This option is especially recommended for diving day tours, since private dive clubs are much more professional and have better gear than the in-house hotel option. Other popular options include the Cebu city tour, island hopping in Mactan and extreme watersports. Day tours to destinations outside of Cebu/Mactan are also available – Oslob whale watching, Moalboal diving or visiting Kawasan Falls and even visting Bohol’s Chocolate Hills. More unorthodox requests are also possible, but of course it’ll be harder to find a group for these as they are usually done as private tours. You can find a full list of available tours, along with a full itinerary in our Cebu packages page. I have already mailed you as well, please reply with your hotel name and the type of tours you’d be interested in. We can take it from there, and i’m sure we’ll be able to assist you in making your days in Cebu as fun and exciting as possible. I am planning to travel to Manila in 2019 I have a few hotels in manila I like and I’m wondering do you have any guided day trips from manila I will be traveling alone and would like to do something day trips from there possibly guided thanks for any help I’m trying to put it all together for now. We will mail you soon with some suggestions. We’d be happy to help you find a group to join, but we first need to get your exact travel dates of course. In the meantime you are welcome to take a look at our manila page to get an idea of possible tours and activities in the city and around it. Generally speaking, the best tours in Manila itself to book a guide for are the old city tour and the culinary tour. If you want to visit the Anthropology museum taking a local, knowledgeable guide can also enhance the experience – but you can enjoy it a lot by yourself as well. Outside of manila guided tours are recommended for Tagaytay, Mt. Pinatubo and Pagsanajan Falls in Laguna. 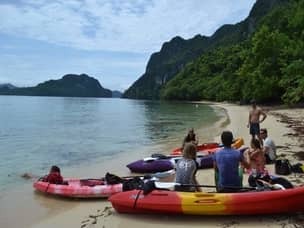 It shouldn’t be a problem to find a group you could join, but keep in mind it might be mostly consisted of local tourists if we don’t have enough requests from foreigners on your specific dates. Hi I and my boyfriend is planning a pakage tour from Manila. I’m wondering if you have any guided tours from manila? We would love to join other groups. We will like to start the tour the 3:rd of december 2017 and want to end the tour at the latest 6:th of december around 12am. On the 6:th of december we are catching a flight so therefore the specific dates and time. Hey Sara and thank you for reaching out to us. Organizing group tours from Manila is no problem, we have a wide selection of attractions we can offer. Of course, it also really depends on what you guys want to do – you didn’t really mention that in your comment. That said, it might be hard to add you and your boyfriend to an organic group for the whole duration because of the very short notice. We will do everything we can to give you exactly what you asked for, but there’s a good chance the only thing we’ll be able to offer are 3 separate whole day tours instead. One of our agents will email you later with some initial offers for you to consider. In the meantime, i suggest you read through this list of tours we offer in Manila, and get some better idea on what activities we can provide you with. Yes we do! But we need to know your arrival date and the places you’d like to visit. Please fill out this inquiry form, and we’ll get back to you ASAP with an offer. I would like to join a group international travel. Can you also send to me your inquiry form? Thank you. . This may be possible depending on your travel dates, and what you want to see and do. The best way would be to discuss it over the phone or by mail – please fill out the inquiry form found here and we’ll take it from there. Looking forward to helping you have a great vacation! Hi…I am planning to visit Cebu from July 21-24, 2018. I will be travelling solo, so if possible, I would like to join a group tour to save me some money. I have my flight and hotel booked already, so i am only looking for tour packages that would suit me. I just filled out the inquiry form, but I’m not sure about the budget that was listed there (way too much for me to afford). Can you suggest me some tour packages that would include Oslob whaleshark-watching, Kawasan Falls + Canyoneering and Osmena Peak trekking (optional)? Thanks. Hi John and thanks for your interest in our services. 1) The budget options shown in our inquiry form are for complete vacation packages. If you are only interested in standalone products then of course we can do that for much lower prices. 2) You can visit our Cebu page and see everything we have to offer there – all tours are available both as private or group. 3) We do not promote the Oslob whale sharks watching, since it is extremely harmful to the whales and marine ecosystem in general. Please read more about our decision here, and kindly consider skipping this tour. hi, i will be in Cebu coming december 6-9, Since i am travelling solo, i would like to inquire if i can join in a group for a tour enjoying, exploring and experiencing different activities like canyoneering, hiking to Osmena Peak, etc. Been to Cebu for a few times but never had a chance to see and explore outside the metro. I havent had booked any hotel bu my coming is confirmed. thank you and looking forward to your resply. I’m not entirely sure about Osmena peak since it’s not such a in-demand tour, but Kawasan Falls is certainly available. If Osmena group tour isn’t available, you can either book it private or we can consider alternative tours such as the Moalboal Sardine run or Bohol’s Chocolate hills. In any case, since your travel dates are quite near, it will be much better if you could drop us an inquiry here and leave a phone number for easier communication. hi, do you have any joiners tour at first week of april 2019?Im an ofw and will have a vacation that time. Hi April and thanks for leaving a comment. I’m sure we can work something out, but could you please leave an inquiry with all relevant details? Would be much easier to match you with the correct group if we know your age, preferred activities and budget. Hi! I’m planning to go to Cebu on solo this February. It’s OK for me if I may join a group. I just want to tour the city, sight seeing or just relax. Can you suggest any package deal that fits for me? Thanks!Appreciate much! Please send an inquiry through our contact form – i need to know the exact dates to see if there are available groups you could join.